The Prince of Wales and the Duchess of Cornwall are to visit hurricane-hit New Orleans during their tour of America. Prince Charles and Camilla's week-long stay in the US, which begins on Tuesday, will also include visits to New York, Washington and San Francisco. The pair are expected to spend a couple of hours meeting those affected in the devastated city in Louisiana on Friday. The trip to the US will be the couple's first joint official overseas tour since they got married. On Monday night a Clarence House spokesperson said: "The Duchess is looking forward to the trip. They're both looking forward to it." In Washington, Prince Charles and Camilla will lunch and dine with President George W Bush and attend a youth event at the United Nations. In New York, they will inaugurate a new memorial garden for the British victims of the 11 September attacks. Prince Charles will also meet UN Secretary General Kofi Annan, and the couple will attend a dinner hosted by the British Consul General at the Museum of Modern Art. In Washington, they will not be staying at the White House, although details of where they will stay have not been released for security reasons. During their three days in the city, Prince Charles will also lay a wreath at a World War II memorial to commemorate the 60th Anniversary of the end of the conflict. The prince is a vocal supporter of organic farming and sells his own line of organic products - Duchy Originals. Last week, he also spoke out on climate change, and he will give a speech at a seminar on environmental issues, while in San Fransisco. As Charles and Camilla prepare to woo the US public, Clarence House dismissed claims that the duchess' wardrobe and beauty regime is being paid for by taxpayers. 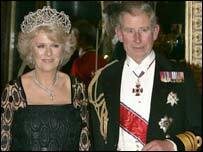 "All costs for the wardrobe are being met by the Prince of Wales's private income - this includes hair and make up. "All other staff are being paid for by the Prince as well," a spokeswoman said. The Foreign Office does pay for travel and accommodation for the staff. But Clarence House denied the couple were taking a 40-strong entourage with them, saying they would only be accompanied by 16 people, including a hairdresser, make-up artist and one dresser.